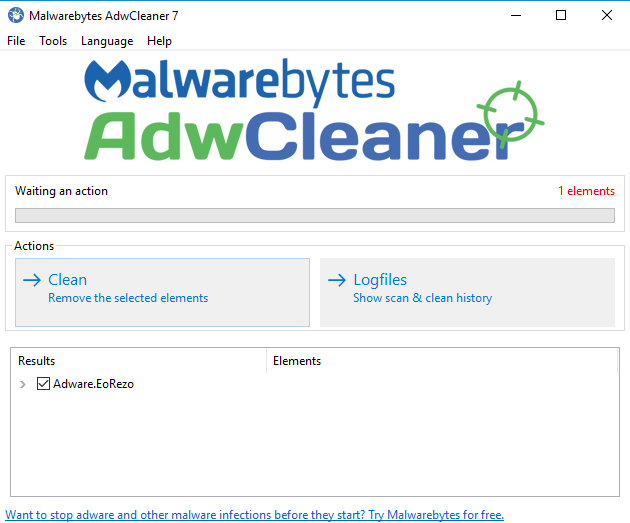 AdwCleaner is a tool aiming to remove adware (ads software), PUP/LPIs (Potentially Undesirable Program), toolbar, hijacker (hijack of the browser's homepage), .. It's compatible with Windows 7, 8, 8.1, 10, each of them in both 32 & 64 bits. TCP/IP settings: Reset TCP/IP settings : correct settings will be automatically restored if the network uses DHCP. Otherwise the reset must made manually. Firewall settings: Reset every firewall rules. IPSec settings: Reset IPSec settings. It's a protocol used to established encrypted connection between hosts. It can cause connection troubles due to specific malicious software. BITS queue: Empty the "Background Intelligent Transfer Service" queue. It's used to transfer files (like software or signatures updates) between hosts, but it can cause connection troubles. IE policies: Delete every Internet Explorer policies and set the ones by default. Chrome policies: Delete every Google Chrome policies and set the ones by default. Chrome preferences: Reset each profile preferences. 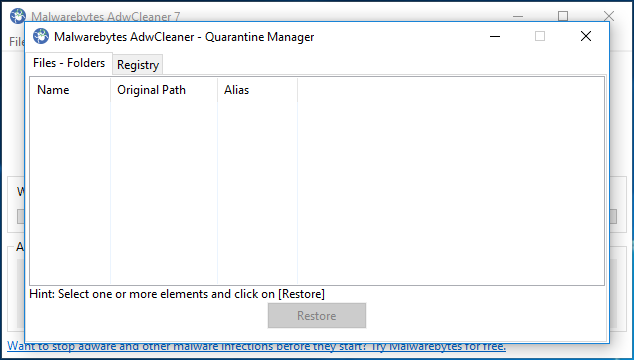 Hosts file: Remove the Hosts file and replace it by an empty Hosts file. Tracing" keys: Delete all Tracing keys. 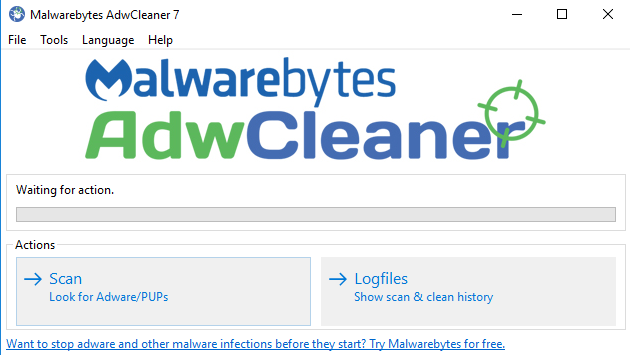 They are used by several malwares. 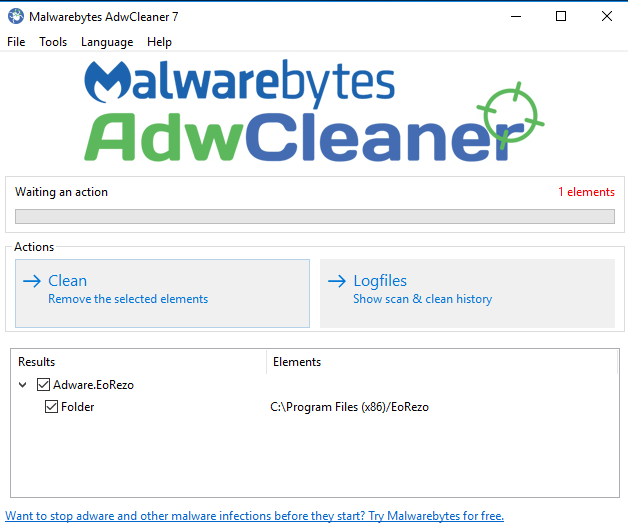 Debug: Generate an additional logfile C:\AdwCleaner\AdwCleanerDebug.log with useful informations in case of troubles. It's useful to share this report on the support section when you face a crash. The scan progress is displayed after every steps. Once it's done, results are displayed, ordered by families. We can also display the details per elements for each family. If no results have been found, an informative message is shown instead. Once the elements to be removed have been selected, all processes are closed. 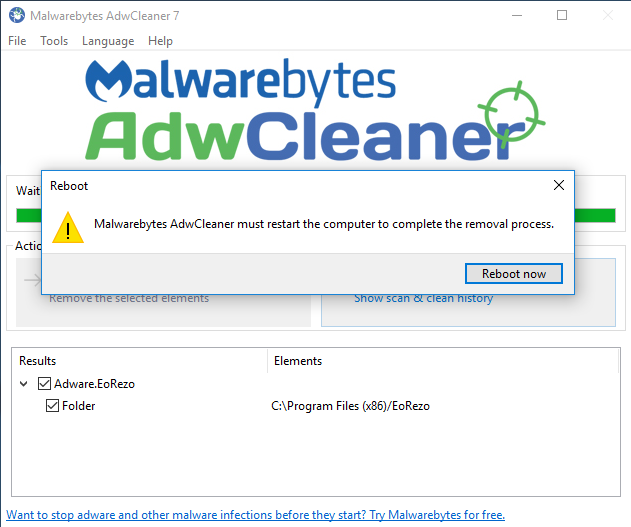 And the computer needs to reboot after the cleaning process. Execute it, then read the EULA and click on "I agree" if you agree it. Click on [Scan] and wait until it ends. When the scan is over, click on [Logfile]. Go to the "Scan" tab and open the first logfile (it should be in blue) by a double click on it. Copy/Paste it in your answer. //Go to the "Debug" tab, select the content, and paste it in your answer. 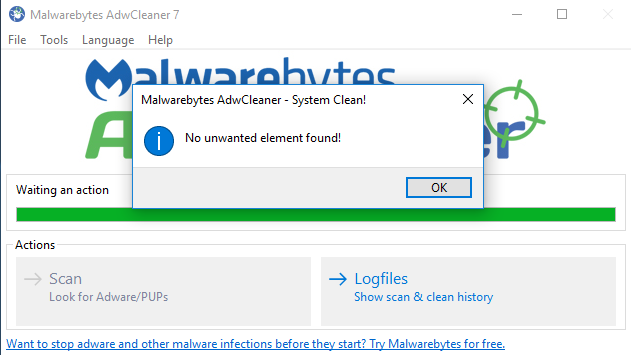 Click on [Clean], read the informative message. If you have any questions about it, please ask. 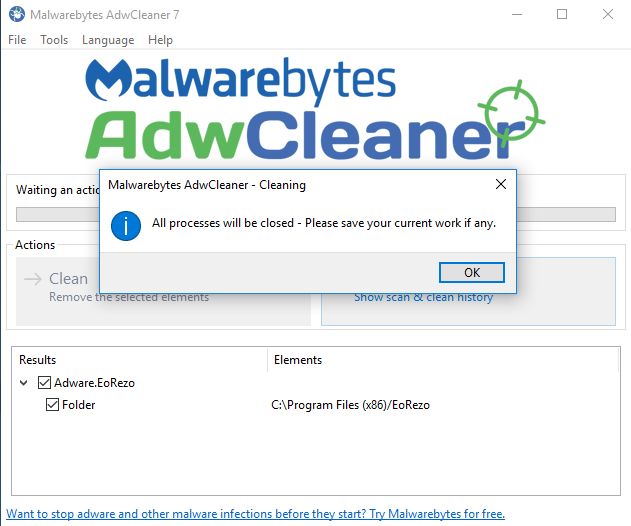 All unrequired programs will be closed during the cleaning process, so be sure to save your work before. //Go to the "Debug" tab, click on the button "Copy to clipboard", and paste the content in your answer too. 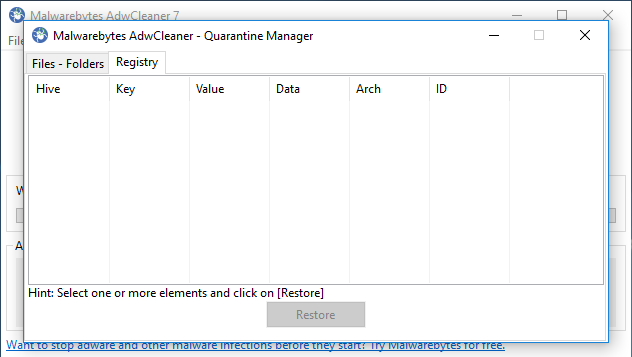 //If the logfiles doesn't appear, relaunch AdwCleaner, click on [Logfile]. 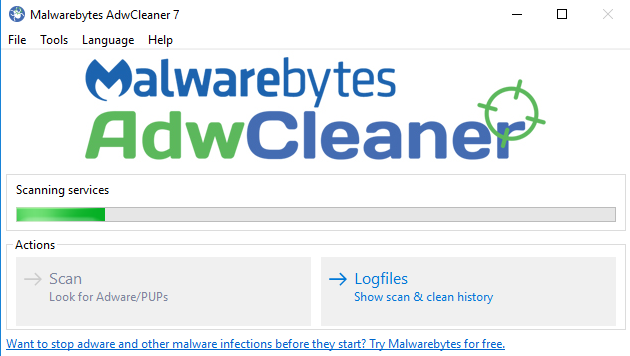 Go to the "Clean" tab and open the first logfile (it should be in blue) by a double click on it. //Copy/Paste it in your answer. Click on "File" > "Uninstall"
But you can also support us: contributions. Corriger les erreurs relatives à "sqlite3.dll"